The Electro feels like a much more complete instrument and has been improved in all the right places. Portable. Well built. Welcome new features. New XL Rhodes samples would be welcome. Since its launch in 2001, the Electro series has established itself as a solid, dependable and authentic-sounding electromechanical piano and organ emulator, with Clavia adding sample- loading ability for 2009's Electro 3. The Electro 5 series comes in three models: the 5HP - a 73-note weighted model with LED drawbars; the 5D73 - a 73-note waterfall-action model with physical drawbars; and the 5D61 - the most compact model with a 61-note waterfall-action keyboard and physical drawbars, and which we're reviewing here. This latest Electro is bright red and it looks very similar at first glance to the Electro 4D. As with all current Nords, you get a full metal chassis/case and wooden end cheeks, sturdy rubberised knobs and tough selector switches. These boards really are built to last - they're proper gigging workhorses you can rely on. The Electro 5D61 is very portable and for most situations the 61-note keybed will suffice, though you can grab the 73-note version or the weighted HP model if you require extra range for piano performances. The waterfall keyboard feels great for playing pianos and synth sounds and seems to feel less spongy, more positive and less heavily sprung than the waterfall keyboard on our Stage 2 SW73, which is a welcome improvement too. Performance control-wise you'll need to budget for a Stage 2(EX) if you want a pitchbend, modwheel and aftertouch but you can connect a foot control pedal for volume changes on both parts and to control Effects block 1. Did we say both parts? Yes we did! This is the biggest change for the Electro 5. You now have two parts available at once that can be split and layered and addressed from separate MIDI channels. For example, you can place an organ on the left, and a piano on the right, (or layer them) or piano on the left and sampled strings on the right (or layer them). "This is the best sounding and most versatile Electro yet - at this price it's pretty much unbeatable!" The benefits of this are huge and make the E5 a much more self-contained machine than previous models. You can also have an organ on both parts and address the upper manual from an external controller. We also tried connecting our Moog Minitaur to the E5 and setting it to the lower half of the keyboard (split) and running a Rhodes sample on the right split and that worked great - simply turn the part mix dial fully right, which mutes the left half of the split, enabling you to hear just the sound of the external instrument. Alternatively, you can mix the lower/upper internal part with the external MIDI instrument's sound. 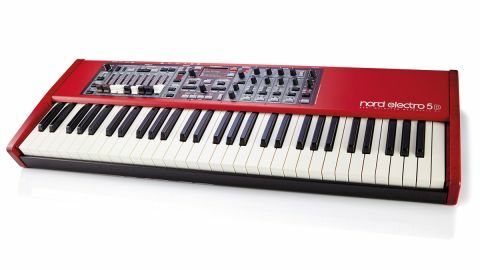 Other newness includes a big OLED screen which is a huge departure for Nord boards but, true to Nord's ethos, there's still no menu diving so the focus remains firmly on hands-on tweakability. This screen allows you to view/select patches more easily, shows drawbar graphics and also works great with the new Setlist and List/Organize features. Setlist allows you to line up four patches on each of the ABCD preset buttons for specific songs, while the List/Organize feature allows you to scroll through/organise a list of patches quickly using the value dial/shift button. It all works very intuitively and is a big/ natural improvement over the old Electros (and the Stage) and I hope it also features on the Stage 3. In addition, there's Live mode (like the Stage) that continuously stores front panel tweaks to three locations. The piano memory has jumped from 180MB to 1GB which now means you can load much bigger piano samples, including the lovely new XL Silver Grand and our favourite, the XL Bright Grand. Like the E4, we still have the long release and string resonance features which add much to the authenticity, although there's no support for the Nord Triple Pedal and pedal noise (as on the Stage 2). Regardless, we still find that Nord's piano samples are our favourites for sheer playability and authenticity. The same downloadable/swappable selection of EPs is available that you'll find in the Stage 2 including a great Yamaha CP80, Wurlitzer EP200 and six Rhodes samples showcasing different models. These all sound excellent for comping or solo work, though we'd still like some new XL Rhodes samples with tighter damper response and a more punchy mid to high range for upfront soloing. The Clavinet samples are still some of the best for authenticity of tone, though a muted sample and key on/off noise are still absent. The piano samples' velocity response curves have recently been overhauled for all Nord piano samples and this has made a huge difference to the playability of the AP and EP samples, especially from the waterfall keybeds. The organ section (which is still one of the finest Tonewheel emulations around) now has the 122 rotary speaker emulation from the flagship C2D organ and you can select close-miked or distance- miked versions, plus tweak horn balance, acceleration and more to taste. In addition there's now a great Principle Pipe Organ (also from the C2D) and a really useful B3+Bass model which allows you to use the pedal drawbars for deep, growling bass - this is a real bonus for organ trio players and LH bass players, plus you can add the B3 bass alongside the pianos and samples too. Add in the great effects, EQ and amp emulations and, without doubt, this is the best sounding and most versatile Electro yet - at this price it's pretty much unbeatable!